The Ministry of Housing and Infrastructure Development has revealed that it has not yet chosen a contractor for the construction of the new State house. Speaking during an interview with ZANIS in Lusaka today, Ministry Spokesperson Jeff Banda, disclosed that only feasibility studies for the construction process have been initiated. Mr. Banda said the suggestion to construct a new state was made about three years ago by a parliamentary committee on infrastructure. The need to construct a new State House was necessitated by calls from stake holders that the state of the current one is old and lacks modern amenities. Mr. Banda stated that for the past three years the issue was not attended to, but he was quick to say that there is an allocation in the 2019 budget for the process to begin. Over the weekend, Minister of Housing and Infrastructure Development Ronald Chitotela said that in 2016 parliament appointed a committee to assess the need to Construct a new State House. The mandate included the assessment of the structural integrity of the existing State House Buildings. According to the Minister, the committee physically inspected State House and their report showed that serious cracks have developed in the structure and that the existing State house built in 1932 for the then governor of Northern Rhodesia clearly has become both a safety and security danger. Just develop Zambia please.Why do you mind loses camped in opposition?a new State house is for all Zambians and it will remain there forever!! !These chaps in opposition are anti-development due to jealous as they know too well that majority Zambians want to see this country developed! !Recall in 2016,Kainde and his team used to say Zambians wont eat roads so PF shall lose.What happened? “SONTA APOWABOMBA” killed Kainde and all his clowns! !The rest is history.Therefore,continue developing Zambia and we shall reward you in 2021-period!! I truly pray the good Lord intervenes by any means necessary to make sure this foolish idea of wasting money never ever happens. Please authorize specialized training for doctors in Zambia. The next president will be evacuated from a beautiful state house to die without dignity in India. I truly pray the good Lord intervenes by any means necessary to make sure this pathetic idea of wasting money never ever happens. They would rather be airlifted from State House to morningside in RSA when UTH is just across the road. This is just more money wasting by this reckless administration. If proper maintenance was being done on the State House over the years, there could’ve been no need to construct a new one. There are so many other pressing needs, where this money could’ve been used, instead of spending it on a new State House. The State House is only 87 years old, while the White House in America is 227 years old. And yet the White House, which is much older, is still going strong. So are you going to be building new State Houses after every 87 years? Stop wasting our meager resources. Just sayin’ – Lazy Lungu wants a helipad to land the helicopter…Sata rubbished these things but we have this Chawama chap Edgar who wants to take off from the building to the custom built Russian 7 seater jet at KKIA…meanwhile there are no drugs and proper facilities in UTH and kids are being taught under trees in rural areas. Where is that lazy man anyway…since he left on 8th ? Of course the crook Ronald Chitotela has not chosen the contractor as he is waiting for someone to give him a big brown envelope…everything is rotten not proper transparent tender procurement systems. If PMs have hearts for the Zambian people they won’t authorize this project. We have a lot of other areas where the funds can be spent. resorting to alcohol & drug abuse due to these greedy politicians. Others are drowning in Mediterranean Sea. Others are fleeing to RSA (where they’re not welcome) to work as maids, plaiting hair or even as pr0stitutes. @ Malozo-10 Downing Street has over 300 rooms. That is not one small house. Don’t let the picture you see always of the residential address number “10” fool you. Who initiated it is not what is being questioned. What’s the logic behind it? Why can’t you carry out renovations on the existing one instead of starting from ground zero? Imagine if the USA government had nincompoops like you, how many White Houses will they have? Wow! Please build it next to my house! Can it be completed before 2021? That name Ronald Chitotela just know someone is getting rich here and the Chinese are somewhere on the background. Chink Construction Enterprise can do a good job, complete with a grant from President XI to further strengthen the long standing bonds of friendship between the two countries. Or maybe Prime Minister Theresa May for leaving us with a dilapidated colonial building fit only for a colonial governor? No, she is too busy with Brexit. Or maybe President Trump? No, he is too busy fighting battles for his Mexico wall. Also government shutdown, no salaries for government workers. So when you turn the current one into a so called museum it will magically stop being a safety hazard? We Have no clean running water in our towns. Our hospitals have no beds, linen or medicine. Our Universities are short of accommodation, teaching aids and lecture rooms. We have schools without desks or windows. 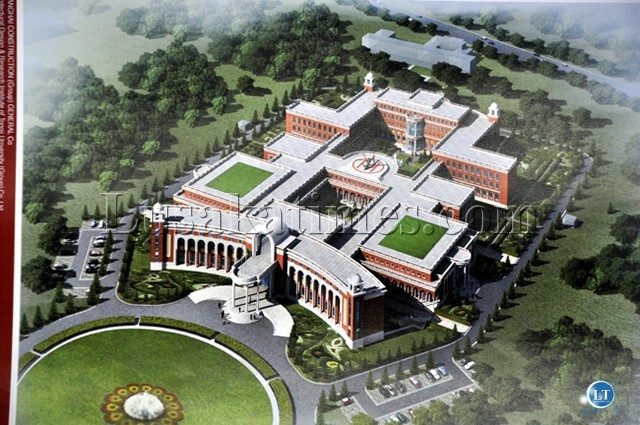 Our President will soon get a Sixty Million Dollar Jet and is about to get a spanking new USD 20Million Crib. High flying, Hi Living. Who says there is hunger and poverty in Zambia? You are also drinking your own feces in your tap water ….these foooools are overwhelming voting for new State House. Its kids like you who need to be educated. Maybe you attended school but i can certainly say that you arent educated or you used to miss vlasses and now you think you can suddenly be the expert in everything. For your information, the White House wasnt built by colonialists in the US, but built by those who knew it who serve centuries unlike the State House which temporary building by the colonialists who knew very well that they would not stay forever in a foreign land. Let Government build the new State House that would be a hallmark for our country! Mwabashani imwe ba opposition, no wonder you will remain in that cave. Said like a typical cadre. To you anyone with a dissenting opinion is opposition. Such type of thinking is retrogressive. The Chinese who most likely will bank roll and build the”New” State House are equally foreigners. So what are you talking about. Stop thinking with your stomach and think of the future generation who will have to pay off some of these unnecessary debts we are incurring. @Malimso. So what you’re saying is, since colonialists built it then it’s substandard? If that’s the case then let’s vacate every single building the colonialists built, because according to you they were not experts. It looks like you suffer from a rare form of hasty generalizations fallacy. The excuses advanced to build this edifice are just not good.Fix the current one and expand for modern amenities where needed just like USA and Britain have done to their more than 200yr old executive mansions .Africans just prove they love poverty with such *****ic decisions. It takes time to build these things. What if I told you that the main beneficiary may be the President after Lungu. It could be Trib.al Hacks if he handles himself well…..kikikikiki….. I see that even the trib.als don’t believe that Trib.al Hacks can ever be President of Zambia, not at the rate he is making a trib.al nuisance of himself. Jay Gay, want to advise your trib.al? Hehehehe…….ati the current state house lacks modern facilities. All those state house tunnels we were shown by Chiluba in 1996? Are those not modern facilities? Ba PF naimwe, should building a new state house surely be our first priority? The existing and newly created districts are desperately begging for development and we can surely treat this state house as our priority? Zampost and some council workers have not been paid for several months……PF don’t do this to us please! Is this the change we voted for in 2011 sure! US$ 20 million can construct a small hydropower plant and electrify some rural areas thereby reducing on deforestation. This current president of s poor sh*thole country like Zambia if he truly worked for the people and not his own pocket and ego would leave the current State House and go to rent a house in Chibolya… convert it into a Museum revenue generation. He doesn’t deserve luxuries any more than a kis starving in Chibolya or Ngombe compound.